Toyota invites you to watch, in its latest ad for the 2020 Corolla, as superstar dance duo BhangraFunk put their own spin on a traditional dance battle with the help of the greater than ever Corolla. The spot features Chaya Kumar and Shivani Bhagwan (the creators and founders of BhangraFunk and BollyFunk, who have become a worldwide phenomenon thanks to their viral YouTube dance videos) driving through the city a 2020 Corolla and joining a group of locals on a rooftop for a dance battle. 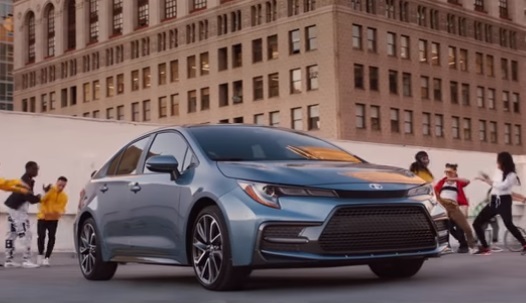 Reveiled in November 2018, the 2020 Corolla is the 4-door version of their recently launched 5-door hatchback. With a track width up by 0.5 and 0.9 inches at the front and rear with respect to its precedessor, the new sedan features a multi-link rear suspension that replaces the torsion beam. Corolla SE and XSE trims boast a new 169-horsepower 2.0-liter inline-four-cylinder engine. All other Corolla trims carry on with a revised version of the 1.8-liter inline-four that lives under the hood of the present-day Corolla LE Eco. Every Corolla comes standard with active safety features such as lane-departure warning, lane-keeping assist, a pre-collision warning system with automatic front braking, and automatic high-beam headlights. The cabin has a 4.2-inch gauge cluster display and a touchscreen infotainment system that are also standard across the board, with Toyota’s latest Entune multimedia system, which includes Apple CarPlay compatibility and a built-in WiFi hotspot. High-level XSE and XLE trims come with an in-dash navigation system and JBL premium audio system.